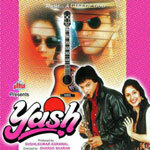 "Yash" is a 1996 hindi film which has Bijoy A, Kartika R, Sonu Walia, Mangal Dhillon, Parikshat Sahni and Dilip Dhawan in lead roles. We have one song lyrics and one video song of Yash. Tabun has composed its music. Jojo has sung these songs while Rajesh Johri has penned its lyrics.